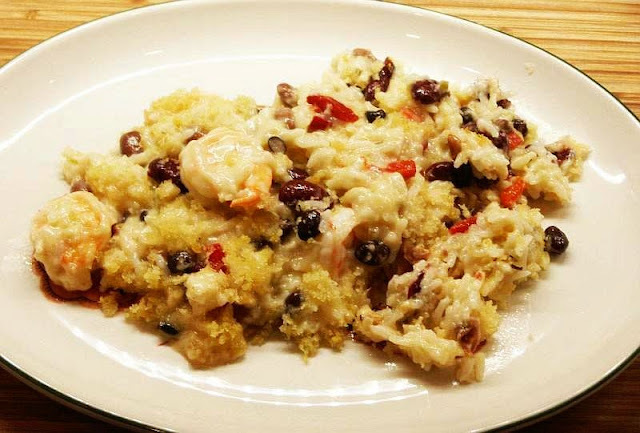 We served this dish over the holidays, but it certainly doesn't need to be limited to that time of year. It would be marvelous with chicken, pork chops or just about anything. Very rich but utterly delicious, which describes Ina's recipes in general, don't you agree? 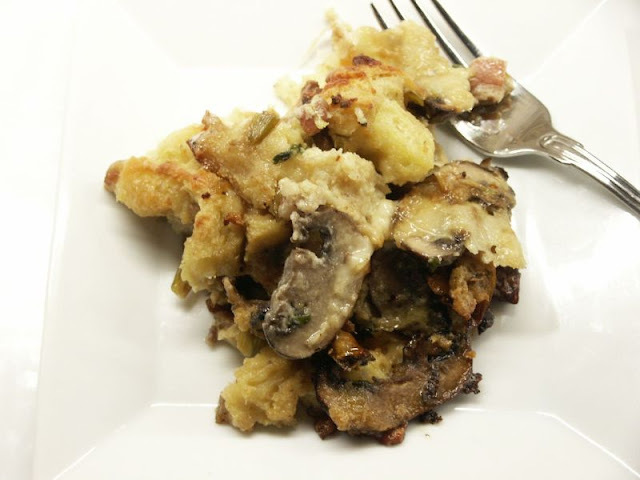 I've been making a mushroom bread pudding for years (my dad's favorite) and while they appear similar on the plate, the flavor of Ina's recipe beats my old recipe by a mile. My book group meets each month in someone's home and it includes lunch. We take turns at either hostessing or reviewing, so it's not a burden on any one person and the hostesses have fun trying new recipes. In the fall, we met at Sylvie's new home. After we oohed and aahed at everything we loved about her home, we sat down at a beautifully set and flowered table to enjoy a delicious and hearty squash soup. Then we were served fresh fruit with a divine topping. Now I've traditionally topped our fruit at Christmas brunch with Ina's lemon curd and limoncello topping, but Sylvie knocked me out with this one and I suspected there was a touch of amaretto in it as well. Yum. So I got the recipe and made it for our family's Christmas brunch in place of Ina's old recipe. Needless to say, everyone was wowed. It's kind of reminiscent of my MIL's old strawberries Romanoff recipe. 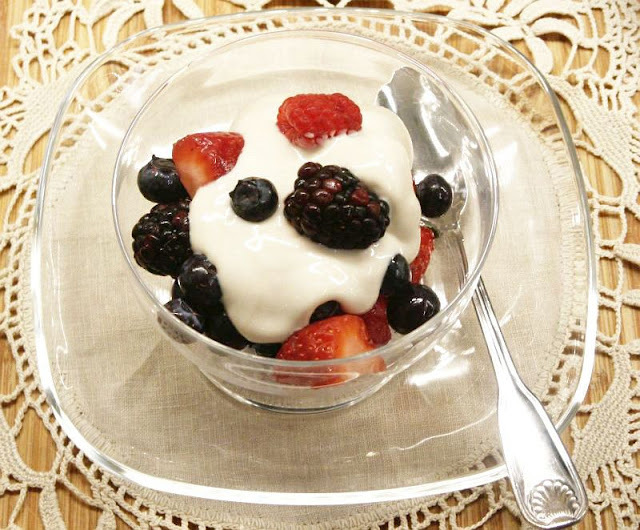 In return, Sylvie asked for Ina's recipe and, noting Ina used yogurt instead of sour cream, said she was going to replace the sour cream in her own recipe with yogurt. Have not heard if she's tried Ina's recipe, but I can say unequivocally that we loved HER recipe. Isn't it funny how sometimes the simplest of recipes makes all the difference in a meal? Combine all 3 ingredients and voilà. Serve over strawberries or a mixture of other fruits. I love my Ottolenghi cookbooks. They're filled with absolutely mouth-watering recipes, each and every one you want to make immediately when you see it and the photography is smashing and so creative. 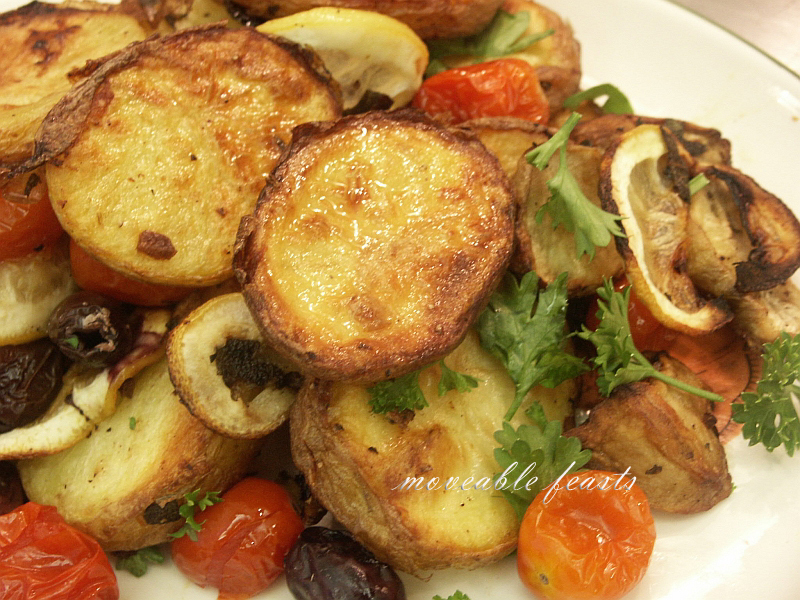 So, while drooling my way through the hundreth reading of my first Ottolenghi, I came across an intriguing recipe for Roast Potatoes and Jerusalem artichokes with lemon and sage. Jerusalem artichokes? I knew the name, had seen them on menus, but didn't know much else, so I Googled it. Not an artichoke at all and commonly known as sunchoke. So my next trip to Whole Foods, I searched for sunchokes and found a bin of them. Ugly, knobby little guys they were too. If I had not been wearing my glasses I would have thought this was fresh ginger. Here's the good news: They taste great...I thought much like an artichoke heart, no matter what everyone says. They are prolific and easy to grow. They are highly nutritious with lots of anti-oxidants. They will keep in the refrigerator for several weeks or in a root cellar all winter. Jerusalem artichokes are a pain to clean. (Mine were. Some are not and can just be washed and sliced.) They must be brushed and scrubbed under running water to remove the sand and dirt that hides among the knobs and folds and while most recipes state they do not need to be peeled, I peeled them as much as I could. And one more thing.....I shall put this as delicately as I can by merely saying sunchokes can cause flatulence in some people. Apparently not everybody is similarly cursed, but I regret to say that I am. I was so taken with the taste of sunchokes that I probably ate 4 of them all by myself. Perhaps I was punished for being such a glutton? Why flatulence? Because sunchokes contain something called inulin. Inulin is a carbohydrate belonging to a class of compounds known as fructans. If you want to get into the chemistry, go HERE. Chocolate and Zucchini has a lovely recipe for sunchoke soup and some excellent suggestions on how to avoid such problems. Did I frighten you off? I hope not, 'cause this dish is mainly about potatoes. 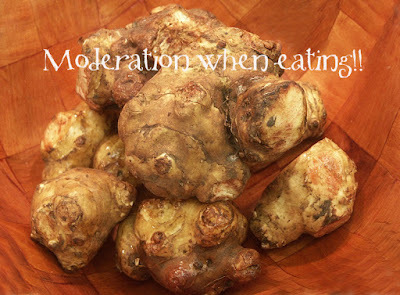 My advice is this: eat sunchokes in small portions until you know your own tolerance. Some people are not affected at all and it would be a shame to miss out on this delicious tuber. Moderation is key. One would think I'd have learned that lesson years ago. Really, this dish is a delicious combination of which sunchokes are only a small part. 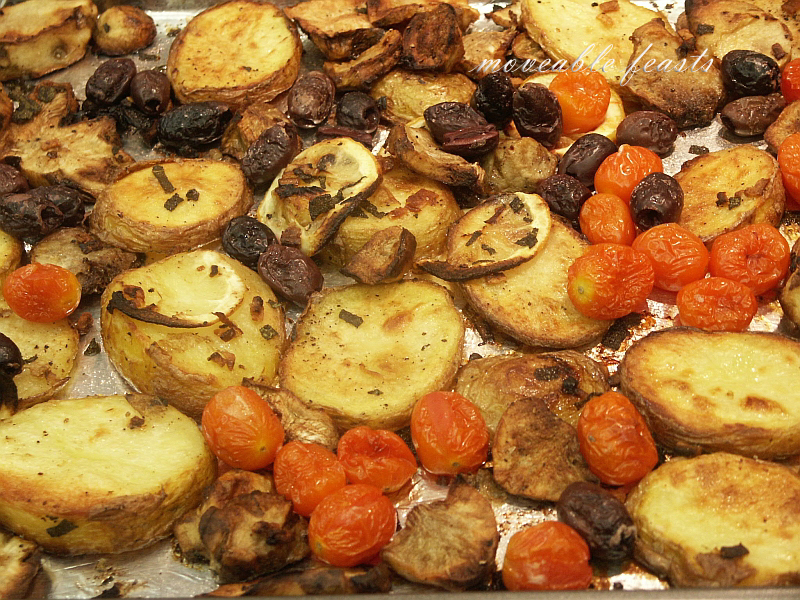 The potatoes and sunchokes are roasted in the oven until they are brown and crunchy. Definitely a great side dish with a lovely piece of steak. Preheat oven to 400 degrees. Wash the potatoes well, put them in a large saucepan, and cover with plenty of cold, salted water. Bring to a boil and simmer 20 minutes, until half cooked. Drain, cool slightly, and then cut each potato in half lengthwise. Put them on a baking sheet. Scrub the Jerusalem artichokes, peel if necessary, cut them into slices ¼-inch thick, and add to the potatoes. Add the garlic, olive oil, sage, salt, and pepper. Mix everything with your hands and put in the oven. Meanwhile, thinly slice the lemon and remove the seeds. After the vegetables have been roasting for about 30 minutes, add the slices of lemon, stir with a wooden spoon, and return to the oven for 20 minutes more. Now add the cherry tomatoes and olives, stir well again, and cook for a further 15 minutes. Remove from the oven and stir in some of the chopped parsley. Transfer to a serving dish and garnish with the remaining parsley. Once again, I'm a tad late to the chocolate party, but had to wait for my chocolate taster daughter to visit. This dark mousse from the New York Times article was adapted from the molecular gastronomist Hervé This. The Times recipe sprinkles the mousse with fleur de sel, which I didn't use here. It's an interesting concept...two ingredients, chocolate and water, which usually don't play well together. But this works. Quite amazingly, actually. You need lots of elbow grease; we took turns whisking. Create an ice bath in a large bowl using ice and a little cold water. Fit a smaller bowl in the ice bath. Place chocolate and 1 cup water in a small pot and heat over medium. Whisk until mixture is melted and smooth, about 3 to 5 minutes. Immediately pour melted chocolate into the bowl in the ice bath. Vigorously whisk chocolate mixture by hand until thick, 3 to 5 minutes. The chocolate should be fluffy and form a mound when dolloped with the whisk. Stop whisking when the consistency resembles whipped cream. Dish into ramekins and either serve immediately or refrigerate until serving. If the consistency is off (if you've beaten it too long and it gets too firm), just melt and start over again. We dolloped some whipped cream on top. 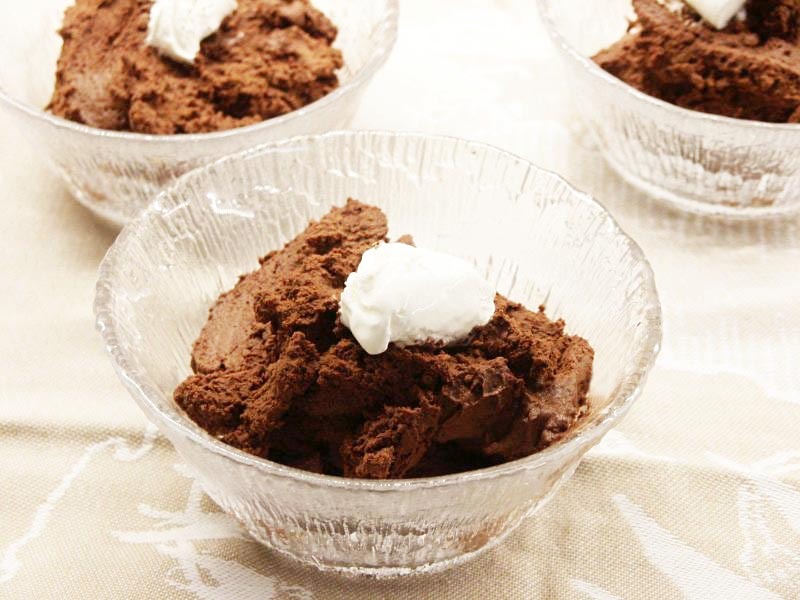 For a lighter mousse, use 265 grams of bittersweet chocolate or just add more water. I know everyone's got Super Bowl fever, but let's not forget Mardi Gras is coming up soon and I couldn't resist making something to celebrate the event. This dish is spicy, cheesy, Cajun and comforting. 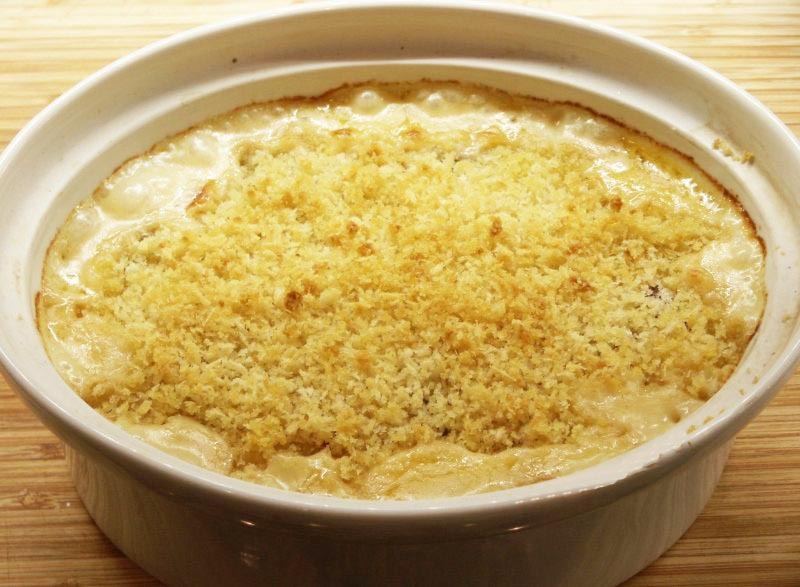 You make it all in one large skillet and then pour it into a casserole to bake. We loved it! Slowly add all three cheeses, stirring and making sure they are fully incorporated. Stir in remaining 2 teaspoons Cajun seasoning, cayenne, chili beans, rice and pimentos. Pour into a 2-quart casserole dish. 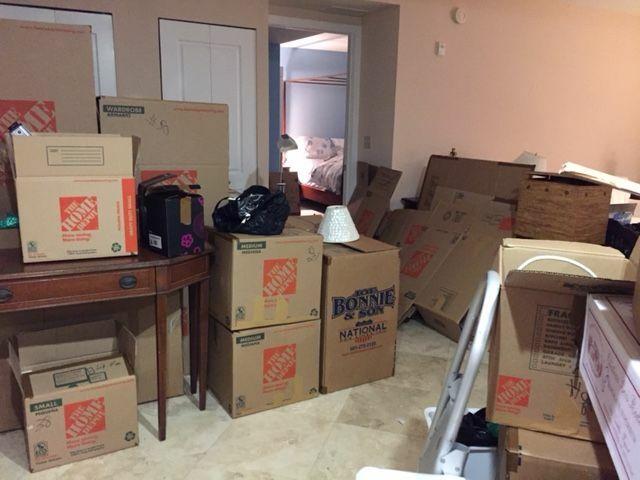 Update on the move. I'm in. Look familiar?